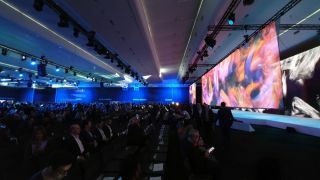 The Huawei P30 launch event is all done and dusted now, and you can see exactly what happened as we brought you all the action from the big event in France. We were shown the new Huawei P30, the Huawei P30 Pro, the new Huawei FreeLace headphones and the Huawei Watch GT Active, alongside some 'smart' glasses that were really just a fancy Bluetooth headset. There were also murmurs of a third handset - the Huawei P30 Lite but that never materialized during the long, busy event that saw at least one writer's fingers needing to be bathed in cold water, such was the speed they were typing at. 15:37 - The Huawei P30 and P30 Pro are available from... today! And that concludes the press conference. 15:28 - To be fair, they look pretty good - still NO DETAILS about how they are smart. Oh, Richard is coming back on stage to tell us... goodness talk about keeping us waiting. There is no pin or button on the glasses, and they are IP67 water and dust resistant. Inside the arm there's a charging module, antenna, dual mic, chipset, speaker and battery. They use beam-forming technologies and AI noise reduction to provide crisp, clear audio. It's basically a Bluetooth headset fused to a pair of sunglasses. Talk about anti-climax. 15:25 - Guess what... still waiting for actual detail other than "smart eyewear" which is all that's currently on the big screen. This better be worth the wait. Apparently this is smart eyewear which will make us look more handsome. Hmm. 15:20 - Richard has ONE MORE THING. They look like sunglasses, but are actually smart eyewear. It's not clear what they do just yet, we're currently watching a very odd video. 15:14 - BUT WAIT. Here's another new product - the Huawei FreeLace wireless headphones with 4 hours playback from just a 5 minute charge, and up to 18 hours of playback on a single charge. The buds are magnetic, and clip together around your neck when you're not using them. When you unclip them, they'll automatically re-connect to your phone. We also say hello to the Huawei FreeBuds Lite, with 12 hours battery life (with battery case). There's a new color for the Huawei Watch GT too, with a 46mm titanium case and 42mm ceramic bezel model with 1 week battery life. There's a new triathlon mode for the Watch GT which will arrive on watches via a software upgrade from today. 15:13 - And Richard has finished talking us through all the new features of the P30 series, and we're getting treated to another promo video. Hopefully we'll get price and a release date once it's over. 15:10 - There are companion products for the P30 series too, including a garish pink glitter case, as well as more traditional flip and wallet cases plus a dive case which waterproofs the phone up to 10 meters. There's also a new power bank, with a 12,000mAh battery inside and 40W SuperCharge technology - it can charge your PC as well as your phone. 15:05 - You can press the power button for one second to launch Google Assistant at any time, and hold it down longer to switch off or restart the handset. There's support for Google's AR Core as well, providing richer augmented reality experiences and the phone comes with AR Measure, allowing you to accurately measure real-life objects. There's also support with some running machines, which allows your run data to be automatically delivered to the P30. The Huawei P30 can also act as a digital car key for seven Audi car models in over 20 countries (a subscription from Audi is required). More brands (including BMW) and models will be available in the future. You can also use the phone as your home and/or office key. 15:00 - There's also Super Fast 40W SuperCharge, giving you 70% of life in 30 minutes. You also get fast 15W wireless charging, and the P30 series feature reverse wireless charging allowing you to charge other devices on the rear of the phone. It's tech we've already seen in the Mate 20 Pro and Galaxy S10 series, but it's good to see it here too. The P30 series arrive with Android 9 and EMUI on board, and we're being shown a promo video for EMUI which is telling us... very little. Richard says the new version of EMUI makes the phones more beautiful, but that may be a matter of opinion. 14:57 - I'm fully re-hydrated and Richard is back on stage to talk to us about performance. CPU performance is up 75%, GPU is up 46% and NPU is up 226% over the P20 Pro, and the P30 series offer "instant app launch" which Huawei claims is over 1 second faster than the iPhone XS Max. The phones also have a dual-SIM card tray, with one space doubling as a NM storage card reader, allowing you to expand on the internal space inside the phone. How are the audience doing you ask? Well the gentlemen next to me has just fallen asleep. Clearly didn't hydrate enough, did he. 14:52 - We're getting close to the end... of the camera segment and we're now looking at DXO Mark scores. The Galaxy S10 Plus, Mate 20 Pro and P20 Pro all scored 109, but the P30 Pro has scored 112. Now Richard has welcomed professional photographer Erik Madigan Heck to the stage to talk about the P30 Pro, so, talk among yourselves for a few minutes. I'm going to have a sip of water. 14:48 - We're moving away from photography, but not the cameras, as we're now looking at video. As well as offering great low-light photos, it can also offer brighter low-light video recording and steadier video with dual OIS and AIS working together to reduce motion blur. "Can you use the zoom on video?" I hear you scream. Well, there's good news as you can do just that - but not up to 50x by the looks of it, it appears to max out at 10x zoom. The P30 Pro can also shoot dual-view video, using two of the cameras at the same time, giving you a close-up and distance shot at the same time. It's not overly clear why you'd use it, but it's there anyway. 14:45 - Want to know what we make of the new Huawei handsets? Well our hands on reviews are now live. Go check them out! Meanwhile, we're back to Richard and we're still talking camera. Huawei has improved its portrait and macro modes on the P30 and P30 Pro as well, allowing you to capture more detail. Both handsets come with a 32MP selfie camera, which Huawei claims will give you the best selfie. 14:40 - Now we're going to get a live demo on stage of long range and low-light photography with Kevin. Hi Kevin! Kevin isn't just use a Huawei P30 Pro, he's also doing this demo with an iPhone XS Max and Samsung Galaxy S10 Plus. Huawei really sticking it to the competition here. Can you guess which phone comes out on top? It's the Huawei P30 Pro, which can zoom much, much closer than the competition. Next up a low-light shot, and the P30 Pro is almost witchcraft-like pulling light seemingly out of no-where, while the iPhone and Samsung fail to get anywhere close. 14:30 - The Huawei P30 Pro comes with AI HDR+, which should keep exposure levels even across your photo, with no dark or blown-out areas. Huawei claims the P30 has best in class zooming performance with a 3x optical zoom and 5x hybrid zoom and 10x digital zoom. The Huawei P30 Pro has the world's most powerful super zoom lens technology with a 5x optical, 10x hybrid and a staggering 50x digital zoom. Again, the examples we're being shown (versus Samsung and Apple) look extremely impressive - but again we'll reserve final judgement for our full review. 14:20 - We're now moving onto photography, with the Huawei P30 boasting a SuperSensing 40MP Lecia Triple Camera setup. The three cameras are a 8MP telephoto, 16MP ultra-wide, and 40MP wide-angle lens. However, the P30 Pro offers more, with four rear cameras. There's a 20MP ultra-wide, 40MP wide-angle, 8MP 5X telephoto and a ToF (time-of-flight) depth-sensing lens. The 40MP camera is the world's first to use RYYB (red, yellow, yellow, blue) sensor (rather than the industry standard of RYGB), which Huawei claims will allow for 40% more light to be taken in, which should result in better low-light pictures. The size of the sensor is also 125% larger than the one found in the iPhone XS Max and Galaxy S10 Plus, again allowing for more light to be sucked in to each shot, with a 25% low light performance increase over the P20 Pro. On the P30 Pro, the main camera and the telephoto camera both have OIS (optical image stabilization), reducing motion blur and improve low light photography. We've been shown an example image taken at 1 Lux (very dark), with the P30 Pro easily beating the Galaxy S10 Plus, iPhone XS Max and the P20 Pro. There's more example shots being shown, and unsurprisingly the P30 Pro is beating the competition hands down using the phone's "One Shot" mode. We'll see if it lives up to the claims in our review. We're still going with the examples versus the iPhone and the Samsung, with the P30 Pro seemingly trouncing the competition in near darkness - the final image showing the P30 Pro can see "the galaxy better than the (Samsung) Galaxy)" in a night shot of the sky. 14:15 - First we're taking a closer look at the design of the new handsets, and we're getting a video to introduce this part. Huawei says the design is "inspired by nature", which we're pretty sure Samsung used several years ago for the Galaxy S3. There are ultra narrow bezels, with the P30 boasting a 6.1-inch FHD+ OLED, 19.5:9 display, while the P30 Pro has a 6.47-inch FHD+ curved OLED, 19.5:9 display. Thanks to the slim bezels, the handsets are narrower than the iPhone XR and XS Max respectively. The P30 comes with a 3,650mAh battery, while the P30 Pro has a 4,200mAh power pack - again bigger than the iPhones Huawei is pitting the phones against. There are no speaker grilles on the phone, with sound instead resonating through the display of the phone. Plus there's an in-screen fingerprint scanner which Huawei says, is up to 37% faster. The Huawei P30 Pro is IP68 rated allowing it to survive short submersion in water, but the P30 is only IP57 rated meaning it's only splash proof. THERE'S A NEW COLOR PEOPLE. It's called Amber Sunrise - it looks red, very red. There's also Pearl White and Black which, well, you can probably guess what they look like. Finally there's Aurora and Blue Crystal, which art blue-green and blue-white fades. 14:10 - Yu says Huawei wants to bring the ultimate photography experience on a smartphone, with professional grade photos and video. And here we are - the Huawei P30 and Huawei P30 Pro are official! Both have a small notch at the top of their displays, and there's plenty of cameras on the rear. Three on the P30 and four on the P30 Pro. 14:05 - Richard Yu, CEO of Huawei Consumer Group takes the stage. He claims Huawei is leading innovation for a better connected life, including advancements in photography, AI, battery, connectivity and interaction. It wants to be a better community, and Yu is now talking about a few implementations of the firm's AI smarts. Track AI uses machine-learning to track movement in the eye, allowing doctors to access patient's eyes and work towards possible cures. 14:00 - Here we go! Bang on time. We're getting a fancy intro video to kick us off, full of color. That mergers into a talking head video, with a spokesperson from Telefonica telling us how good Huawei is at 5G and smartphones. Now Vodafone is having its say, and it's expecting success with the foldable Mate X and the new P30 this year. And yup, Orange is also getting a chance to tell us how good Huawei, and the P30, is in this video. It's a clear play in the light of global questions around the firm's security, especially from the US. 13:53 - "Ladies and Gentlemen, the press conference will start in five minutes. Please take your seats." We're still two minutes ahead of schedule. Exciting. 13:48 - "Ladies and Gentlemen, the press conference will begin in 10 minutes. Please take your seats" booms out across the PA system. I make that two minutes ahead of schedule, Richard Yu must be desperate to get on stage and show off the latest phones! "No Richard, not yet" says the flustered stage manager as they struggle to hold back an eager Yu from storming on stage. ... Is how we assume it's going down backstage right now. 13:40 - The big focus today is going to be on camera, the tagline of the event is 'Rewrite the Rules of Photography'. It's what Huawei has mainly been teasing about the phone and rumors suggest the P30 and P30 Pro could boast mammoth zooms (likely digital, rather than optical). 13:20 - There's no questioning that we will see the Huawei P30 and P30 Pro today, with branding for the names seemingly everywhere - however there's still a chance Huawei will have something else to show us, with a new smartwatch the current front runner. I've been told the press conference should run just a little over an hour, which means by 3pm CET (2pm GMT, 10am EST, 7am PST) we should know everything Huawei is launching today. 13:10 - We're now at the event in Paris, and I've even got my very own seat. It's now a little under an hour to go until everything kicks off. 11:25 - This is becoming commonplace for Huawei now. The company has already put adverts up around Paris of its Huawei P30 and Huawei P30 despite the fact neither have been announced yet. 10:00 - We're just four hours from launch, and while you wait for Huawei's new flagship phones, why not revisit the handsets that are set to be replaced today. 09.15 - It's not just smartphones that Huawei is set to launch today though, with the firm teasing a new set of earbuds on Twitter. Called Freelace, the new buds will come in at leasr four colors, although little else is know about them at the moment. We will, of course, bring you all the details on the new Huawei Freelace headphones as they're announced right here, in our live blog. 09:00 - Today's the day. We're in Paris, France for Huawei's first major launch event of the year, with the Huawei P30 and P30 Pro all but guaranteed to be the stars of the show. Both handsets have been subject to numerous leaks over the past few months - including from Huawei itself - and we've rounded up everything you need to know ahead of the launch event today.